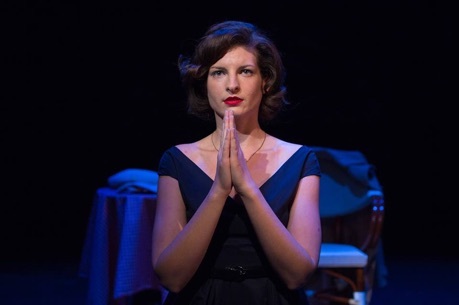 The Headstrong Collective is currently presenting a fascinating double bill of two one-act plays concerning women in Europe who survive World War II in very different ways. Melanie Hrymak’s Licking Knives, a hit at the 2014 Toronto Fringe Festival, concerns a nameless Ukrainian woman. Manfred Karge’s Man to Man, written in 1982, is based on the true story of an woman living in the former German Democratic Republic. Both plays ask how far a person will go to survive. 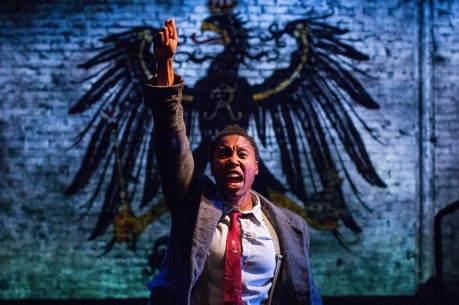 Together the plays provide a portrait of life under fascism in Europe. The evening begins with Hrymak’s play which is the more straightforward of the two. After a series of projections establishes the setting as Paris we meet a fashionable young woman in a 1950s-style narrow-waisted, crinolined dress. When she speaks to us we hear not a French accent but a Slavic accent of some sort. We learn that she was born the youngest of six children to a farming couple in Ukraine. While the other children are employed doing heavy work, she is given the job of planting seeds. She sees what possibilities life holds for her in her village and they consist only of getting married to a farm boy, raising children and hard work. She vows that she will escape this future, but her escape comes in a quite unexpected way. When the Nazis overrun Ukraine, her brothers are conscripted, her oldest sister is taken away to work, her sister with a limp is left at home and she is taken away as an Ostarbeiter. Hrymak does not explain this background because her character does not understand what has happened to her. Hrymak’s character simply does what she is told, but also tries to learn enough German to read the newspapers she throws out. This leads her to include information in her bimonthly postcards home about how the war is going. We don’t know if this is the reason, but one day she is prevented from going to work and instead is sent to an unknown part of Germany to work on building a tunnel as a form of punishment. How she moves from this dire situation to her present life of freedom in Paris is the main puzzle of the play. Hrymak gives an engaging but very restrained performance. In speaking of the Ukrainian girl she once was, it is as of she were talking about someone else. Her unhappy life in Ukraine and unhappier life in Germany has left her conflicted about the past and about who she is. She is whoever she is now even if that means losing her heritage. Thus, melancholy and nostalgia percolate below the calm surface that she presents. Man to Man is a completely different kind of play with a completely different kind of woman at its centre. Karge’s play is written in poetry, mostly in free verse but sometime in rhyming couplets, and is divided into 27 short scenes. They do not present the smooth narrative of Licking Knives, but rather seem like fragments of a life gathered together. There are, therefore, narrative gaps as we move from scene to scene forcing us constantly to reorient ourselves as the central character, Ella Gericke, tells her story. Like Licking Knives, the play begins after the war, not in the 1950s as in Hrymak’s play, but in the present. (Karge revised the play to reflect the reunification of Germany and Headstrong presents this revised version.) Ella Gericke (Lisa Karen Cox), after telling us how she could disguise herself as a Turk to get work in the new Germany, goes back to how she used a disguise to get work before. When she married her second husband Max, Max thought all he suffered from was sciatica. It was cancer. Realizing that she would be destitute without her husband’s income, Ella disguised herself as Max, a crane operator whose job she had learned from his tales of work. Max was introverted and no one ever saw him working so high above, so Ella is able to pull off the subterfuge. The hardest test is when the men insist on his socializing with them. But she learns how to play skat and drink as heavily as they do. When the Nazis come to power, Ella’s greatest fear is to avoid being drafted and undergo a physical. In a typically disjunctive moment in the monologue, Ella begins describing a prison cell in detail. We assume she has been imprisoned for some reason. It turns out that she has volunteered to be a prison guard and part of the SA or Sturmabteilung, a paramilitary wing of the Nazi party, and has thus avoided detection. What is also apparent from this episode, and when East Germany is taken over by the Soviets and when it is later reunited with West Germany, is that Ella’s political affiliations change with the times. Like Brecht’s Mother Courage (1941), she changes sides because her number one priority is survival. Like Brecht’s Good Woman of Setzuan (1943), she takes on a male identity to be able to do things she could not do as a woman, but winds up stuck in her male role. Thus, her great longing to have baby, movingly portrayed by Cox, goes unfulfilled. The performances of Hrymak and Cox are completely different. Where Hrymak is all restraint, Cox is physical and extroverted. Where Hrymak is ladylike, Cox in her persona as Max is gruff, loud and gangly, we tend to forget the actor is female. When Cox does play female characters, they seems like simpering caricatures. The result is that we eventually realize that we don’t know what Ella Gericke is really like. And that, of course, is a major point of the play. Doing anything to preserve her self by playing roles or changing politics, has left Ella with no sense of what that self actually is. Ella’s image of herself as Snow White of Grimms’ fairy tales, becomes more and more a fantasy. While Licking Knives is a straightforward tale, simply but effectively acted and directed, Man to Man is a much more complex tale effectively acted but not always clearly directed. While Hrymak makes discreet use of Karyn McCallum’s projections, usually simply to set scenes, Kelli Fox uses projections and animation throughout. The problem is that with a poetic text like Karge’s where we have to listen carefully to decipher when, where and why events are happening, overuse of projections becomes distracting. We need to focus on the actor and what she is saying, not on the moving images on the wall behind her, especially when these images, even when drawn from Käthe Kollwitz or George Grosz, do not illuminate the action. In spite of this, we have to be grateful to have a rare chance to see Man to Man, a play that the Guardian’s Michael Billington named this year as “one of the great modern classics of European theatre”. To see Karge’s play in conjunction with Hrymak’s presents a provocative portrait of the plight of women living during wartime and how the struggle to remain autonomous can impact the struggle to retain identity – two issues that are as relevant now as during World War II. Photos: (from top) Image for Headstrong Collective double bill; Melanie Hrymak; Lisa Karen Cox. ©2015 Nathan Kelly.